ApexNetwork Physical Therapy in Maryland Heights, MO hosted a ribbon cutting ceremony on April 5th. Maryland Heights Chamber of Commerce members, along with clinic owners Josh and Kim Kaburick and employees celebrated the opening of the new clinic. ApexNetwork looks forward to becoming a part of the Maryland Heights community! The clinic offers rehab services including physical therapy, sports rehab, hand therapy, industrial rehab and manual therapy. The Maryland Heights clinic is located at 12674 Dorsett Road. For more information, call 314-384-9049, or go to www.apexnetworkpt.com. 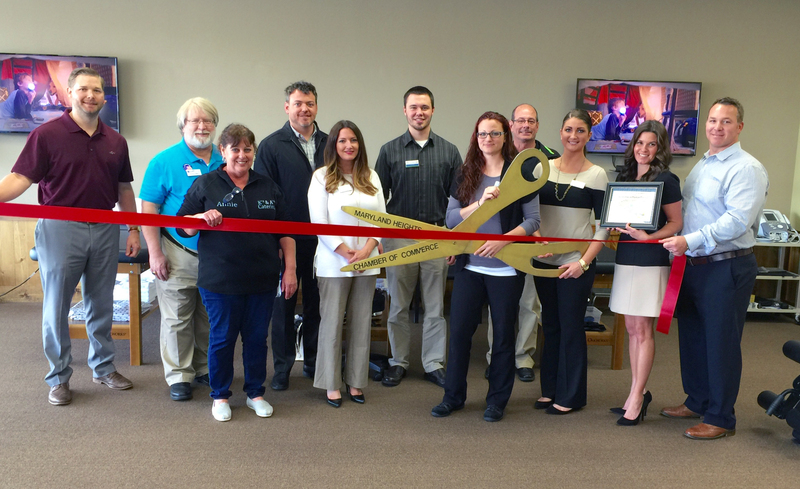 Ribbon Cutting Ceremony Held in Maryland Heights, MO! ApexNetwork Physical Therapy Now Open in Bernalillo, New Mexico! New Location To Open in Des Peres, MO! ApexNetwork Physical Therapy Opening Soon in Lincoln, IL!